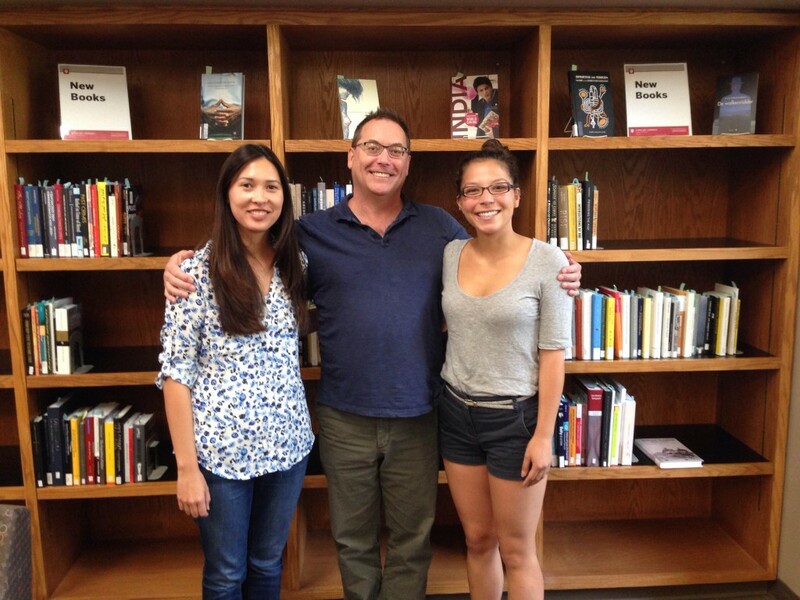 The IUScholarWorks team is growing! We recently welcomed several new faces to the Libraries’ Scholarly Communication Department, including one full-time staff member and two student employees. I’d like to introduce you to Richard, Miko, and Erica. Richard spent a good deal of his childhood wandering the stacks of a small college library in his hometown. After moving to the midwest, he worked in publishing and taught English and Digital Humanities while completing a Ph.D. in literary studies at IU. Since then he has specialized in ways that digital and computational technologies can enrich scholarship in the Humanities. He still loves books, in whatever form. Miko Siewenie is a senior majoring in Informatics with a Computer Science cognate and minors in Spanish and Marketing. On campus, she’s actively involved with Indiana University Student Association as the student government’s Co-Chief of Marketing and Webmaster and the Indiana University Journal of Undergraduate Research as Information Technology Chair and Webmaster. Miko also works for the Office of the Vice Provost for Undergraduate Education as the Student Coordinator of the Indiana University Undergraduate Research Conference, the School of Informatics and Computing as a Supplementary Instruction Leader, and last, but not least, IU Libraries as IUScholarWorks Technology Assistant. When she finally escapes campus, she enjoys cooking, skiing, crosswords, and bad movies. Erica Hayes is a second-year MLS/MIS dual degree student at Indiana University–Bloomington, where she specializes in scholarly communication and digital special collections. Her student library jobs span digital publishing, instruction, outreach, and project management. Erica is currently a graduate assistant to Dr. Milojovic and Dr. Sugimoto. In addition, she also works as the Web Development Assistant at the Lilly Library. This year she was given the opportunity to work as the Master’s student research assistant as part of the IDEASc (Integrated Doctoral Education with application to Scholarly Communication) Fellowship Program. She is excited to work with IUScholarWorks and learn more about open access publishing.